Posted on October 12, 2017 by treelawyer	tagged. The news out of California is not good: wildfires consuming homes and thousands of acres of forest and wilderness. It’s the kind of thing Smokey Bear always warned us about (and no, his name is not “Smokey the Bear.” We thought it might be a good time to revisit the tale of the Great Storrie Fire of 17 years ago. One hot August day in northern California, a Union Pacific track repair crew let some grass next to the tracks catch fire. They tried to put the blaze out … rather ineffectively, it turns out. The Bear was not amused. By the time it was all over, 81 square miles of national forest burned in the Storrie Fire of August 2000. The Forest Service, which has compiled a poor record of reforestation – chiefly because of lack of money – sued Union Pacific for the cost to rehabilitate the burned-out area. 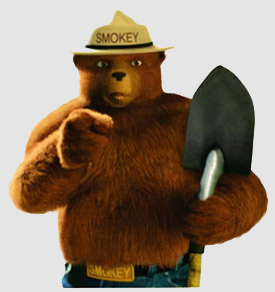 Smokey Bear would have his day in court. Before the case was to go on trial, the lawyers tussled over the proper measure of damages. The railroad argued that the correct measure was diminution of property value caused by the fire. What’s more, the losses had to be mitigated by the value of the timber that could be salvaged from the burned land. The catch was that most of the land was restricted by law, and could not be harvested until the law expired several years after the fire. Union Pacific argued that if it could have been sold, it would have fetched so much that the damages only reached about $5.7 million. The Government cried foul, contending that the traditional measure of damages wasn’t appropriate for natural resources. Instead, it claimed damages to the timber, damages to the soil, reforestation costs and loss of environmental habitat to birds and mammals on the order of $167 million. Over 71,000 acres were burned by a railroad crew’s careless fire. Big difference! So the crucial battle was joined, well before the trial commenced, when the court was asked to rule on what damages would be allowed. When the decision was handed down, it turned out to be a bad day for the railroad. 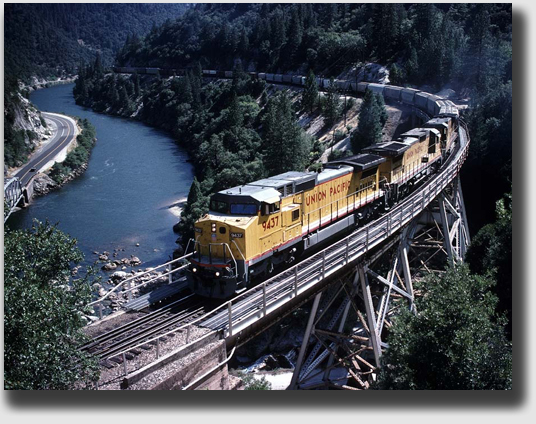 The trial court showed little sympathy for Union Pacific, holding that California law let the Government pile on the damages – timber, soil, reforestation and loss of habitat. What’s more, in a double whammy if ever there was one, the District Court ruled that, even though the timber on the restricted land couldn’t be sold in 2000 (and couldn’t be for many years thereafter, because the law was extended), the value of the timber was appropriately considered in setting damages. OK, Union Pacific conceded, but then the salvage value of the timber left on the restricted land should be considered in mitigation. No, the Court disagreed, it couldn’t be considered … because it could’t be sold. The law, you know. Having been thoroughly sandbagged by the Court, the railroad knew better than to go to trial. It settled the case for $102 million. And that was real money back then. For all of the Court’s feel-good rhetoric about the sacred trust of the national forest, the Forest Service hadn’t done very much to remedy the mess the fire left behind in the eight years after the fire. Private landowners who suffered loss have done much more, but then they’re not hamstrung by regulation and interest groups. Once the Union Pacific millions started pouring in, the Forest Service didn’t have any excuse for further sloth. How about Union Pacific? A settlement of over $100 million has to hurt, right? Take heart — the venerable old railroad had insurance. As for the national forest, it’s slowly returning to green. 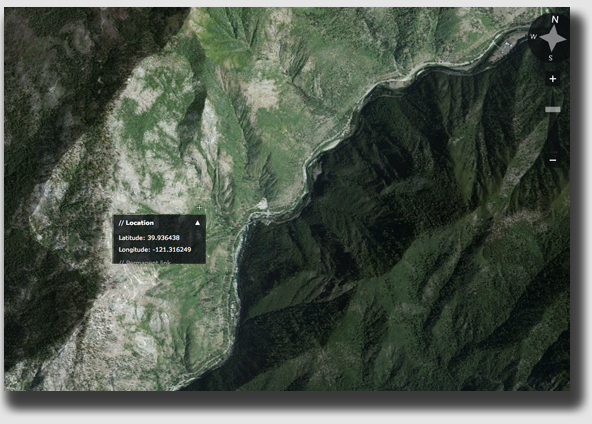 But even an untrained eye looking at August 2013 satellite pictures can tell that the timber is gone. To the north and west of Storrie, rising from the Feather River, the unforested land stands in obvious contrast to the rest of the area. The interesting tree law lesson drawn from today’s case is the Federal District Court’s free-wheeling approach to damages. With a creative lawyer, a political hot potato and a sympathetic court, the sky can be the limit. United States v. Union Pacific Rwy. Co., 565 F.Supp.2d 1136 (E.D.Cal., 2008). A Union Pacific (“UP”) track repair crew negligently ignited the fire while repairing a rail, and — not recalling their Boy Scout days — didn’t put it out properly. The resulting conflagration, known as the “Storrie Fire,” destroyed 52,000 acres of National Forest in August 2000. The Government sued UP. Union Pacific on span northeast of Storrie. The issue raised before Federal district court ncerned the proper measures of natural resource damages, whether diminution of the market value of the forest land was the over-arching measure of the Government’s damage in the case, and if not, whether the Government may recover as separate injuries timber damages of over $121 million, reforestation costs of $33 million, and loss of habitat and environment during the period of regrowth of $13 million. Also, some of the National Forest had been specified by Congress as being temporarily exempt from timber harvest. Had the trees on these lands not been wholly destroyed by the fire, the Government could have harvested the trees over time, after the expiration of the law. Similarly, no logging or reforestation was allowed in the Bucks Lake Wilderness at the time of the fire, and the general forest areas were lands where commercial logging may occur subject to other legal restrictions, such as environmental assessment requirements. The Government conducted salvage sales of the charred timber that was not located on restricted lands, recovering $335,616. UP contended a post-fire salvage sale of the burned timber on the restricted lands — had federal law permitted it — would have generated over $73.6 million. UP claimed that at most, the Government incurred only $5.7 in net lost timber value ($79.3 million minus $73.6 million). Held: The U.S. District Court found that the loss in market value of the land was not the proper measure of damages. Instead, the Government could argue to the jury that it was entitled to recover damages for damages to the trees, to the soil and pre-merchantable timber, and its loss of use of habitat and environmental services during the period of forest regrowth. UP would not be allowed to argue at trial that it was entitled to an offset based on the theoretical salvage value of the timber. Finally, the Government’s habitat equivalency damages were legally permissible. 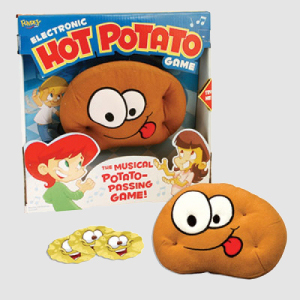 Don’t kid yourself – the case was a political hot potato, and politics undoubtedly influenced the District Court decision. Thus, the Court held, the Government – as the injured party here – was entitled to full compensation for all of its damages, considering the unique character of the land at issue and that natural resources have values not fully captured by the market system. Resource damages, including timber damages, rehabilitation and restoration costs, and environmental and habitat damages all were recoverable as separate injuries, the Court ruled. In this case, the fire damaged the Government’s property and reduced its value, not only through destruction of trees used for timber, but through damage to the soil. In addition, the USFS was required by law to replant to a certain minimum density, and they incurred expenses in their salvage operation. These, the Court said, were separate injuries. UP also argued that the Government couldn’t recover damages for the value of the trees located on the restricted lands because commercial logging of those lands was not permitted by law. But, the Court held, when the Storrie Fire occurred in August 2000, the restriction was set to expire in 2004. Had the fire not destroyed the trees within the restricted areas, the trees would have been commercially available for harvesting within a few years, and the Government could have recovered their timber market value. Instead, as a result of the damage caused by the fire and the subsequent decay of the burned trees, the trees were dead or dying and no longer had any viable timber value. That the law had subsequently, post-fire, been extended, the Court ruled, was of no consequence because at the relevant time in 2000, the law had a definite expiration date. UP argued that in areas where commercial logging is not allowed the reasonable cost of reforestation is the proper measure of damages, but the Court rejected the argument. It said that the Government’s timber damages of $121.9 million were supported by detailed expert analysis of actual timber values. The Court waxed eloquent that UP had wholly ignored the wilderness areas in question “[w]ere national treasures created by Congress ‘to secure for the American people of present and future generations the benefits of an enduring resource of wilderness’ … ” In such circumstances, the Court held, the Government could recover damages for the timber burned in the wilderness areas. Destroyed timber values were a relevant means to capture at least part of the lost value of the burned lands because there is no available real property market value by which to determine the pre- and post-fire value of thousands of acres of national forest lands that can’t be sold. UP asserted that if such damages were permitted by the court, it should be allowed to argue to the jury that the damages calculation did not account for the full administrative costs that the Government would have incurred in marketing unburned timber at the prices it claims, including environmental assessment costs and road building costs. The Court disagreed, holding that the harm in this case was caused by UP’s admitted negligence which essentially created a “forced sale” of the trees. Thus, the Court said, deduction for administrative costs was not appropriate. 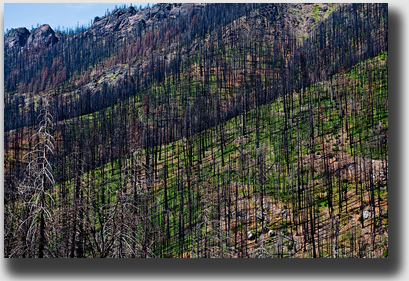 The area of the fire – 13 years later, growth was still sparse. Finally, UP argued it was entitled to an offset of the timber damages based upon the amount UP contended the Government could have obtained in a theoretical post-fire salvage sale of the timber on the restricted lands, $73.6 million. The Government argued against this, noting that the law prohibited the post-fire salvage sale. UP agreed, but pointed out that the law also prohibited a pre-fire sale, and thus, if the Govern-ment were permitted damages based in part on the theoretical pre-fire, sale value of the timber on these lands, UP should also receive a corresponding offset to those damages based on a theoretical post-fire salvage sale. The Court disagreed, holding that salvage value is a question of mitigation after actual damages have been ascertained and then only for amounts that were realized or could have been realized. Thus, assessment of the Government’s actual damages are a separate inquiry from the assessment of the Government’s duty to mitigate its damages after the commission of the tort. Under the doctrine of avoidable consequences (or mitigation of damages), the person injured by another’s wrongful conduct may not recover continuing damages “that the injured person could have avoided by reasonable effort or expenditure.” Thus, the Court said, UP was entitled to an offset of damages only for the salvage value realized by the Government for its salvage sale with respect to timber not located on the restricted lands.